DC 1400 is a versatile dust collection unit for wet and dry applications. It is ideal for smaller jobs when a high level of portability is desired. This new product is the perfect complement to PG 400, PG 280, K 3000 Vac and DM 220. DC 1400 comes complete with hoses and accessories. Two specially developed adapters are included for perfect attachment to our recommended Husqvarna products. Compact design, low weight, highly portable. Automatic dust filter cleaning prevents clogging while working. Auxiliary start/stop system enables remote start/stop of the DC 1400 when starting/stopping a connected hand tool (max 2200 W). 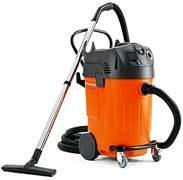 Can be used as heavy duty dry/wet vacuum cleaner. Automatic dust filter cleaning Automatic dust filter cleaning prevents clogging while working. The 8 ft. long hose enables DC 1400 to perform on a large area. Multi adapter the DC 1400 includes an adapter for easy connection to PG 400, PG 280, K3000 VAC and DM 220. Motor 3x, 1200 W, 1.9 hp. * Please call us with any questions about our vacuum shop vac system for k3000 rentals in Cincinnati OH and Southeast Clermont County in Ohio.